Eliott Flores, a Dreamer, is determined to make his voice heard by the powerful. As he stood in a clearing among some trees, the Washington Monument just behind him, Eliott Flores, a 17-year-old Dreamer, could just about see to the other end of the National Mall, where the U.S. Capitol sits. Yet, for Flores, a DACA recipient, the Capitol and the debate within it seem just out of reach. 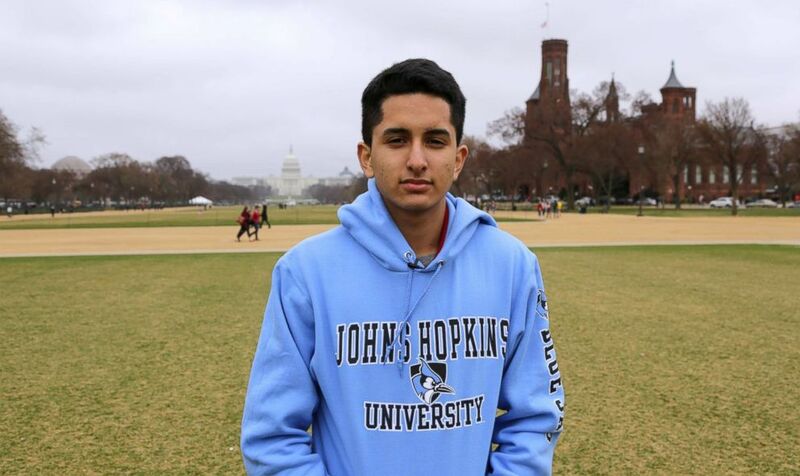 (Janet Weinstein/ABC News) Eliott Flores on the National Mall during a trip for college visits arranged by his high school in Houston, where he lives. A junior, he's facing the quandary of affording college without the avenues for federal aid that many U.S. citizens receive. Though he will turn 18 just weeks before the 2018 midterm elections, he is keenly aware that he does not get to vote for the lawmakers deciding his future. Instead, Flores is focused on encouraging others to utilize their vote. “We cannot take a vote, we cannot stand for ourselves and we depend on other people who have the opportunity to actually vote to make a difference for us,” Flores said during a recent visit from his hometown of Houston, Texas, to Washington, D.C., for college visits. He’s nearing the end of his junior year. Soon, he’ll face the quandaries of trying to afford college without being able to take advantage of the avenues for federal aid that many U.S. citizens have. On Tuesday, the 2018 election season kicks off in his home state of Texas as voters cast their ballots in the primaries for state and federal offices. This year, by pure coincidence, the midterm primaries come just one day after the date Trump set for DACA’s termination, arguing its creation by then-President Barack Obama was unconstitutional. DACA, or Deferred Action for Childhood Arrivals, protects young people like Flores, brought to this country illegally as children — often called Dreamers. For now, the deadline packs little punch as federal court rulings have allowed DACA to stay in place while courts consider challenges to Trump’s decision. But those young people who are just now old enough to apply for DACA are stuck in limbo. While DACA renewals are being processed, new applications are not. Texas is home to the second largest number of DACA recipients in the country. Roughly 16 percent of Dreamers live in the state, largely split between the Houston and the Dallas metro areas, according to the Pew Research Center. It is also a state where immigration is a major political issue. The Democratic Congressional Campaign Committee is actively targeting five House seats — one of which is Texas’ 7th Congressional District, where Flores lives. Democrats are also targeting the seat held by Republican Sen. Ted Cruz, who has previously said he was against a path to citizenship for Dreamers. The frustration over Congress’ inaction and no way to channel it electorally has led young people like Flores to become more politically engaged. “Donald Trump and the government have woken up a monster. The power of the youth, and young people like Eliott,” Flores’ mother, Mayra Medrano, said in a phone interview partially translated by her son. (Courtesy Mayra Medrano) Eliott Flores with his father, Noel Flores, and his mother, Mayra Medrano over the holidays last year. Flores speaks publicly at rallies for immigrants’ rights and he recently joined a campaign in Texas’ 7th Congressional District for Democratic candidate Ivan Sanchez. He also started a club at his school, inspired by the organization that helped him with his DACA application two years ago. He frequently posts on the club’s Instagram account to publicize events that may impact other DACA recipients. Frequently, he gets direct messages from strangers. “Why are you in this country? Why don't you just go back home? Isn't it better than suffering here like you're already doing?” the users will ask Flores. 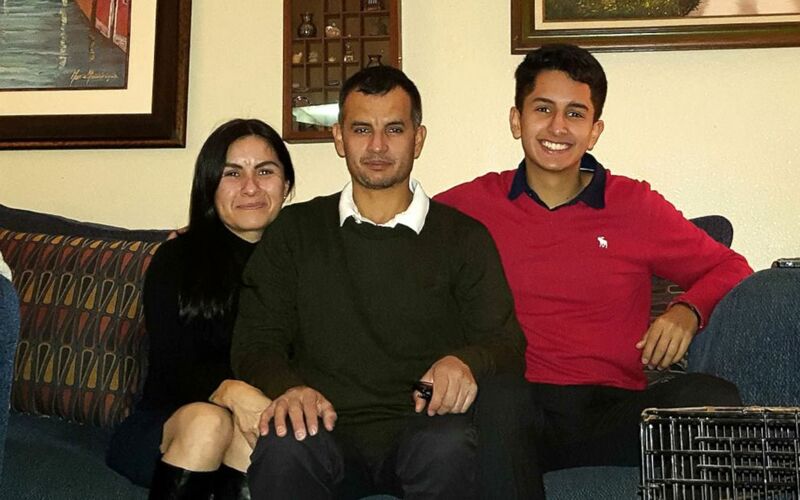 His parents moved to the U.S. from Mexico for opportunities with their young son after they married. Recently, his son traveled back to Mexico. Through DACA, he was granted a permit for travel outside the country and went to take care of his sick grandfather, who passed away three months after Flores left to go back home to Houston. 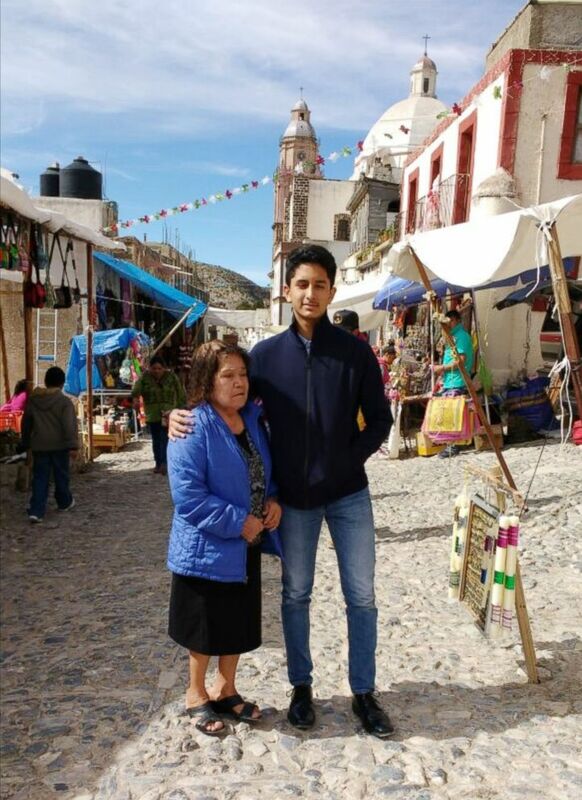 (Courtesy Mayra Medrano) Eliott Flores stands with his grandmother in San Luis Potosi on his first trip back to Mexico since he moved to Texas 15 years ago. “I felt the protection and safety of living in this country. But at the same time, I realized that I was still undocumented and I had to work hard to make a difference,” Flores said. While his parents are glad the politics around immigration have been eye-opening for their son and for people around the country, they also know that he is facing an uphill battle politically. Can those without a vote, influence the vote? Unlike other reliably blue states with high numbers of Dreamers like California or New York, Texas is different. It’s a historically Republican state with powerful incumbent presence, said James Henson, director of the Texas Politics Project, an organization based at the University of Texas, Austin. Latino voters in Texas also have historically low turnout and tend to be more conservative, he said. For DACA recipients hoping for political change, these present some tough headwinds. According to Henson, the subject within border security and immigration where Republicans may have a softer stance, however, is the Dreamers. “I think the DACA recipients exist in an interesting safe harbor for moderate Republicans,” he said. But that doesn’t mean DACA recipients are likely to get the same level of attention from Republican candidates as they will from Democrats — whose supporters overwhelmingly back a continuation of DACA. That’s because DACA is still part of a “broader landscape” on immigration and border security issues “that has generally played to the Republicans advantage in the state in the last few cycles,” Henson said. And while that may be true, Henson also pointed out that the state doesn’t exist in a vacuum – movement on DACA across the country could affect Texas. Recent nationwide ABC News/Washington Post polls on DACA found that 87 percent of Americans are in support of the program and a legal pathway to citizenship for Dreamers. But Jillson, over at Southern Methodist University in Dallas, thinks this year might be different — that given the level this issue has mobilized Democrats, Republican “reservations” could play well for Democrats in the general election. “Trump’s dithering on DACA and the Republicans unwillingness to move on the issue will energize some young voters,” Jillson said. At a time when Flores feels like his future is at jeopardy, it’s hard to rely on others to make a change, he said. “It comes with the realization that other people, depending on their vote, they will have a huge effect on my life and other lives as well,” Flores said. Not being able to vote is but one of the obstacles he has learned about since finding out he wasn’t born in the United States — something he only learned in ninth grade. 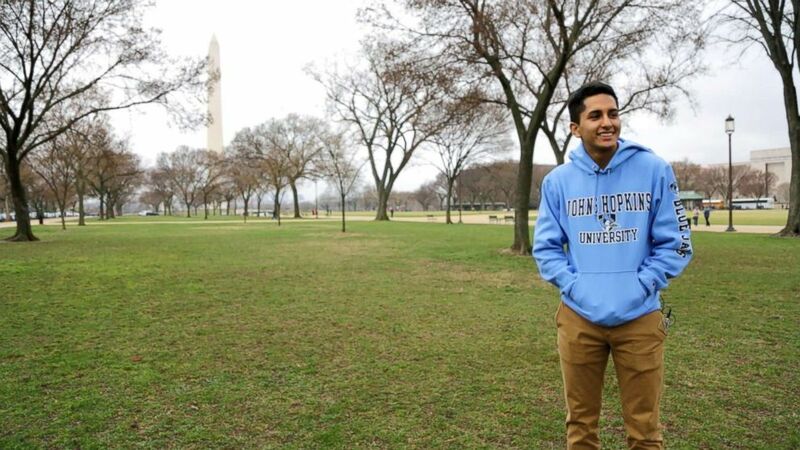 (Cheyenne Haslett/ABC News) Eliott Flores during a college visit trip to the D.C. area. His life hangs in the balance as Congress works on legislation to protect the Dreamers. Flores will turn 18 just weeks before the 2018 midterm elections, but will not be able vote. One day, he brought home a field trip permission slip from his school for an international summer trip. He couldn’t travel internationally, his parents told him. It was then he learned he didn’t have legal status — and the implications that would have in his day to day life. Flores was 15. “[My parents and I] had a little conversation — about three hours long — where they had to explain to me that I wasn't like all my friends, I couldn’t have the same opportunities as them, and unlike them, I wasn't born here,” he said. He understood that in waiting to tell him about his status, Flores’ parents “were in a way trying to protect me,” he said. These days, the Flores family doesn’t steer away from the conversation on immigration: they’re forced to confront it every day, Eliott’s parents said. Recently, they said, a neighbor was detained, an experience which hit close to home. “Every day, every minute, in the morning when we wake up, when my husband and son arise, we talk about it,” his mother said. “This is like a bad dream,” his father said. Because of this, Flores said he and many other Dreamers often feel an urge to prove themselves. For Flores, this manifests through enrollment in AP classes, summer courses and extracurriculars like sports or volunteering at a hospital in Houston. His achievements are a stark reminder that the things that may come naturally to peers, like the right to vote at 18, aren’t always in the cards for him.